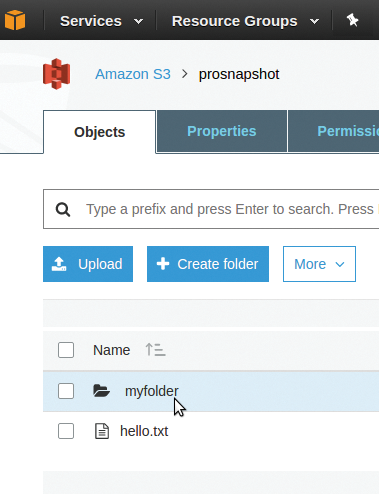 Data produced on EC2 instances or AWS lambda servers often end up in Amazon S3 storage. If the data is in many small files, of which the customer only needs a selection, downloading from the browser can bring on finicky behavior. Luckily the Amazon toolshed offers Python libraries as pipes for programmatic data draining in the form of awscli and boto3. and then answer the questions for the applicable AWS zone, specifying the username and password as you go. You then receive an access token, which aws stores in ~/.aws/credentials and, from then on, no longer prompts you for the password . command to retrieve it from the cloud and store on the local hard disk, just as in the browser (Figure 1). Figure 1: The browser moves selected S3 files from the cloud to the hard disk. installs the SDK on your system. Listing 1 uses boto3 to download a single S3 file from the cloud. In its raw form, S3 doesn't support folder structures but stores data under user-defined keys. However, the browser interface provides the option to create a new folder with subfolders to any depth in a bucket and fill the structure with files (Figure 2). Figure 2: Subdirectories appear in the browser, which S3 later simply integrates into the key for a storage object. Under the hood, S3 replicates these folders as a key with file paths in typical Unix style. This grabs the file from myfolder in the prosnapshot bucket. However, if you want to grab all the files in an S3 bucket in one go (Figure 3), you might stumble across the idea of listing and processing the files with objects.all(), as shown in Listing 2. This method works perfectly with buckets of up to 1,000 objects, but because the underlying REST interface only provides a maximum of 1,000 results, the loop stops at the 1,001st object. Figure 3: All files are in an S3 bucket. The boto3 program provides paginators as a solution to the dilemma; they fetch a maximum of 1,000 objects, remember the offset, and keep retrieving the data until the bucket is processed. Listing 3 fetches all the files in a bucket from the cloud. It interprets your keys as Unix paths and stores the contents of the returned objects in local files of the same name. For large S3 buckets with data in the multiterabyte range, retrieving the data can take a while – depending on your Internet connection – or the time overhead can be completely prohibitive. In these cases, Amazon offers a sneakernet service to export your data: Customers send their hard disk or storage appliance to Amazon, who fills it up and sends it back .